The extensive price hike for a vital, life-saving drug for many with allergies is causing concern among doctors, patients, and politicians—along with a guy responsible for an extensive price hike himself. 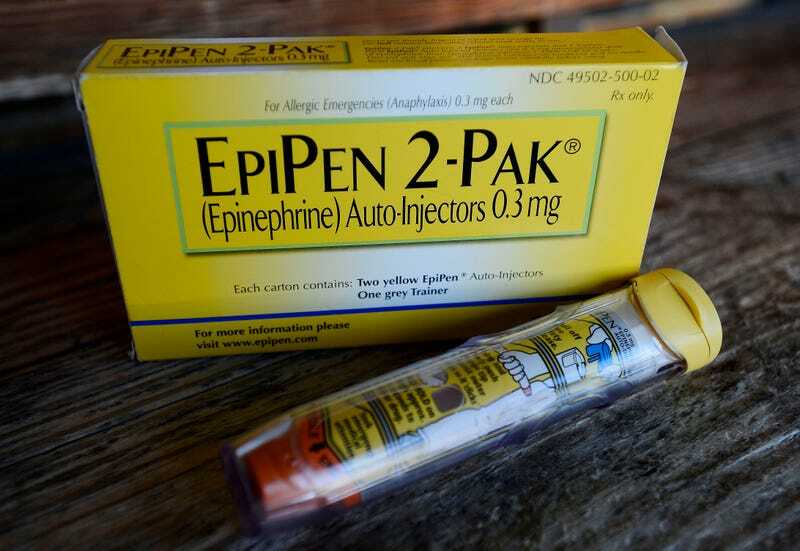 Mylan pharmaceutical, the maker of the EpiPen—a portable epinephrine injector that can potentially save someone having a life-threatening allergic reaction—is being accused of raising the price of the product from around $100 in 2008 to $500 today. In all, that’s an increase of over 400 percent. This is especially worrying because Mylan has a near monopoly in the business, especially after one of its competitors issued a recall last year. Doctors have likened its brand dominance in schools to that of Kleenex. Many schools have emergency epinephrine in stock and there are states pushing for legislation to make that mandatory. The increase is so high that Pharma Bro and person that hates Gawker Martin Shkreli, who for months was the most hated person on the internet after his company, Turing Pharmaceuticals, acquired a 62-year-old anti-parasitic drug and jacked the price from $13.50 a pill to $750, spoke out against the move. “These guys are really vultures. What drives this company’s moral compass?” he told NBC News. According to a financial report released last week, Mylan’s sales have gone up, thanks in part to the EpiPen. With good insurance, and with the help of coupons, it’s possible to pay very little for an EpiPen. However, those without adequate insurance in the United States are left without many alternatives, especially in pharmacies. So, it’s caused a number of officials to speak out, including former presidential candidate Bernie Sanders. He expanded his sentiment in a statement sent to NBC News. NBC stated that while there isn’t a House committee investigation in the works, there is a lawsuit on the way. It’s just worrying that through all of this, Shkreli is using the issue to be the voice of reason. When he calls out your company, you know you’ve screwed up. We’ve reached out to Mylan for comment and will update if we hear back. It also stated that the company has a number of programs that’ll help supplement the cost of the EpiPen, including a savings card.